What started as a desire to create a higher standard of service and quality to Lincoln's floral community in 1976, still thrives today. In 40 years the company has grown to meet the needs of it's plant and floral customers. With nine career florists make up a staff that is dedicated to providing only the best quality flowers and most stunning arrangement for any occasion. And, if the delivery is just a few doors down or to the other side of the world, we can ensure the arrangement is on budget and on time. OAK CREEK PLANTS & FLOWERS is a local flower shop and greenhouse in Lincoln, NE offering a wide variety of fresh flowers, beautiful tropical house plants, and creative gift ideas to suit any style or budget. It is our pleasure to assist you with any local, as well as worldwide deliveries and remember that corporate accounts are always welcome. For your convenience, we offer daily floral delivery to local funeral homes and hospitals. We hope you enjoy your online shopping experience with secure 24-hour ordering right at your fingertips. If preferred, you may call us to place orders direct at (800) 421-3135 or (402) 421-2999. Gift Ideas for All Seasons & Reasons Shop from our Green Plants, Blooming Plants and Dish Gardens for a gift that adds life to any room or office. We also offer a variety of other choices… Fruit Baskets, Gourmet Baskets, Gift Baskets, Baby Gifts, Candy & Chocolates, Gifts, Greeting Cards, Home Décor, Scented Candles, Silk Flower Arrangements, Plush Stuffed Animals, Balloons and more! Custom Flowers and Plant Rentals for Wedding & Special Events Call us at (800) 421-3135 or (402) 421-2999 to schedule a consultation. We would love to help you start planning flowers for your dream wedding or any special event – large or small. Our talented designers create bouquets, flower arrangements and on-site decorating with each client's individual style and budget in mind. We also offer tropical plant rentals for any type of event. Plant rentals are a unique and affordable option to add some life and beauty to any event space! 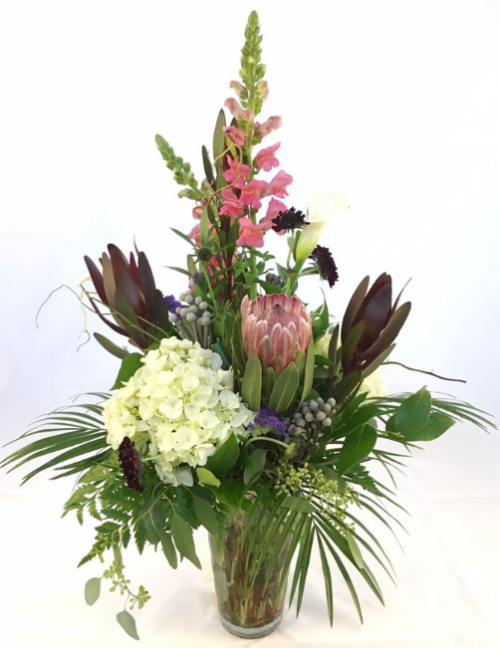 Gorgeous Sympathy Arrangements & Funeral Flowers Remember, you can always depend on us when you need to send flowers for the funeral of a friend or loved one. We will design and deliver a funeral arrangement that thoughtfully conveys your heartfelt condolences. For flowers and plants delivered fresh every day - call OAK CREEK PLANTS & FLOWERS! Order flowers straight from our website or call us today to speak with one of our designers. Interiorscaping and Plant Maintenance Oak Creek offers interiorscaping and plant maintenance services for your business or home. If you would like to add some beauty and life to any space, but you don't necessarily have a green thumb, our plant maintenance service may be a perfect option for you! For a reasonable monthy fee Oak Creek will manage all of the plant care for you. One of our full-time plant maintenance employees will visit once a week to take care of all watering, fertilizing, pruning, cleaning, and pest control. Also, in the event that any plant gets overgrown or does not meet our high quality stardards, we will replace the plant for free. Please call us at 402-421-2999 and ask for Evan or John to inquire about our interiorscaping and plant maintenance services. Wholesale Tropical Plants Oak Creek is Nebraska's largest wholesale tropical plant distributer. Our 10,000 square foot greenhouse is stocked year round with an extensive variety of tropical house plants. We offer biweekly delivery over a 200 mile radius distribution area. For more information about our wholesale division please contact Evan, Colin, or Scott at 402-421-29999.